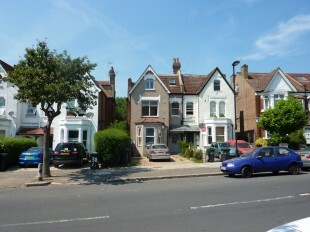 Today I went to see a 2 bed flat in Streatham which was just a few minutes walk from the common. It was a lovely road – well more like an avenue – it was wide and tree lined. Residential and felt good. The flat was a victorian conversion and I saw the house from the road. It looked in OK condition – a bit tired around the edges. I let myself in the back gate so that I could check out the rear and work out which flat was for sale (it wasn’t a viewing day but as I was in the area thought I would do a rece). Having just let myself in I was confronted by a young lady holding a baby who was just a few days old. I apologised profusely that I had let myself in the back garden and explained that I had seen the flat up for auction and that I was coming to take a look. Well she was lovely – she told me all about the area, the building and the reasons for sale…the extension which the flat had been built in had been built illegally and now the owner had been served an enforcement notice! Turns out the flat was actually a 3 bed (though it had been listed as a 2 bed) and the enforcement officers had said it had to be part demolished as it contravened planning and building regs. As the extension was also built on the neighbouring property (where that flat was also for sale) I knew then that I would have to buy both to make the project viable…but I didn’t have the money for both. So I called my friend Nick who’s a fellow property developer. Nick came along 20 mins later surveyed the building and agreed with me that we had to buy both – and there may be an opportunity. So we agreed that we would read the legal pack the next day and bash heads…well 60 pages of legal and council jargon later I realised the project was a non starter. Basically the only way of making the project viable was to demolish the lot (which was only about 5 years old) and to start again! Which means all you were buying was a plot with planning issues – and at the guide price made no sense! Oh well it was a nice day out in sunny Streatham all the same! I’m beginning to sense a theme here climbing fences to take a gander… I admire your pluck, I’ve done it myself but easy for me I’m not female and petite! It’s a great blog Sam, keep it up. I’m really enjoying it. Let us know what happens with the ex squat.